With 40 hour work weeks and a constant demand for performing and producing on the work front, after-work hours are all we’re left with to unwind and relax. Since this time is mostly spent at home, modern homes, especially kitchens, are all about maximizing convenience and eliminating all that cannot afford us that. This is probably why we are more than happy to ditch traditional (read tedious and unbecoming?) kitchen rituals and wares, not realizing that they were designed to bring us the most amazing health benefits! So we help you bring back a few things from your mom’s era (and her mom’s) that are easy to incorporate, good to look at (who wouldn’t want an exotic vintage twist in the décor!) and most importantly, promise a healthier life! 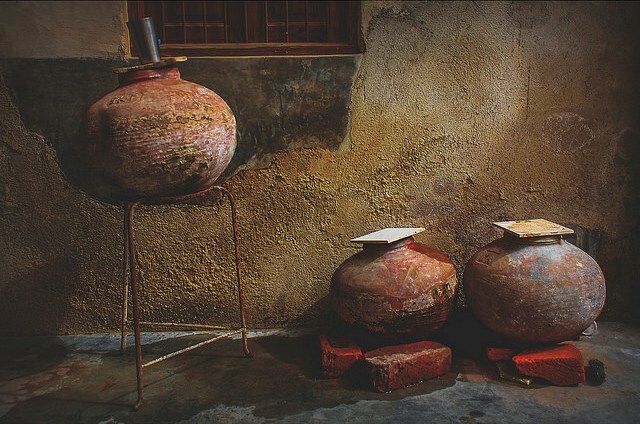 This earthen pot (used for storing water in the olden days), that we have so merrily traded for plastic, stainless steel and other synthetically manufactured materials, has tiny pores all over its body that gives it passive cooling properties. It allows water to evaporate from its surface, similar to the way a human body functions, keeping the stored water cool. Most of us have grown up on its soothing coolness and earthy flavor that would quench our thirst on hot summer days, like nothing else could. But with refrigeration taking over, out went this very healthy practice! Clay pots were also popularly used for cooking as they would impart a distinct earthy flavor to the dish. Health Tip: Naturally cooled water from clay pots is readily absorbed by the body and is brimming with micro-nutrients that it soaks up from the kiln fired earthen pot. According to ancient texts of Ayurveda, storing water in copper metal would naturally purify it by ridding it of many harmful viruses and bacteria. This is why copper-ware such as lotas were and should be used to store drinking water overnight. This should be had first thing in the morning. Copper is also an essential micro-nutrient required by the body and two litres of water stored overnight in a copper vessel can take care of 40% of our daily requirement of this metal. Health Tip: Though only a trace amount is needed, copper helps stimulate the brain, act as anti-carcinogenic, regulates functioning of the thyroid gland, maintains acid-alkaline balance in the body, helps in healing of internal wounds and slows down ageing due to its antioxidant property. This country is known for its tradition of eating out of silver utensils, which is probably why silver dinner ware and cutlery have always been an important part of a bride’s trousseau, gifted to her by her family. But what we might not know is that eating out of silver was not just a sign of luxury and wealth, but a healthy practice prescribed in Ayurveda. So it’s clearly not to be kept locked up in the cupboard or to be taken out for the annual Diwali dinner. It makes much more sense to make it a part of our daily life for its numerous health benefits! Some of us might also remember our grandmas boiling milk with silver (and gold) coins. This was practiced to impart cooling properties to the milk and prolong its shelf life, since silver kills pathogens and acts as a natural preservative! Though it’s now almost forgotten in Indian kitchens, iron is a metal that deserves to return to its rightful place. Apart from using heat very efficiently, saving cooking fuel and acting as a (healthy) non-stick vessel when well heated and greased, it also iron-fortifies the food cooked in it as a bonus! Probably this is why our grandmas would prepare the tadka (tempering) in iron pots. So this Diwali, as part of the annual home cleaning, let’s re-invent our kitchens into ‘temples of health’ that they were always supposed to be, while letting the rustic elements give a twist to the decor! Posted in Ayurveda, Decor, Food, History, Homes, inspiration, Tips, Wondrous India and tagged Ayurveda, clay, Copper, copper water, grandma tips, health benefits, iron, Rituals, silver spoon, traditional indian kitchen, wellness. Bookmark the permalink. Sartorially Set: What to wear this Diwali?